Heat oven to 425°F. Spray large rimmed baking sheet with cooking spray. In large bowl, mix mushrooms and olive oil. Toss to coat. Place mushrooms, stem side down, on baking sheet. Sprinkle with 1/4 teaspoon salt. Bake 9 to 11 minutes or until mushrooms release liquid. Carefully pat mushrooms dry with paper towels. Wipe off baking sheet, then line with cooking parchment paper. Meanwhile, in same large bowl, mix bacon and cream cheese. Carefully spoon mixture into mushrooms. Place bread crumbs in small bowl. Press filled mushroom tops, cheese mixture side down, into crumbs (about 1/2 teaspoon bread crumbs per mushroom) and place on baking sheet, bread crumb side up. In large bowl, mix melted butter, vinegar, 1/4 teaspoon salt and the pepper. Add salmon; turn to coat. 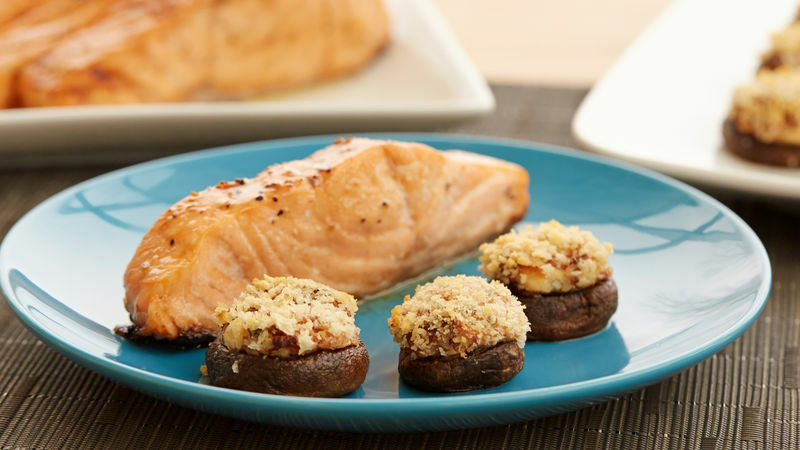 Place salmon on baking sheet with mushrooms. Pour any remaining butter mixture over salmon. Bake 18 to 22 minutes or until salmon flakes easily with fork and mushrooms are tender, and filling is heated through and golden on top. Don’t have cooked bacon on hand? Use the same baking sheet and 425°F oven to cook the bacon, too. Place thick-cut bacon in single layer on greased baking sheet, and bake 18 to 22 minutes. Transfer to paper towel-lined plate to drain. After the first bake, really dry out those mushrooms – less moisture means more flavor.